You are here: Home / Portfolio / Website Design – Meyer Environmental Ltd.
Meyer Environmental are asbestos removal and asbestos survey specialists based in Portsmouth, UK, serving an area from Dorset in the west to Kent in the east, and taking in parts of Greater London too. Their field of expertise is a busy and highly competitive one in the UK, and an existing website was not ranking as highly in their area for asbestos removal and asbestos survey services as they would have liked. They contacted us to see if we could make a difference – and that’s what we set about doing. Diligent market research and keyword research was key here, as we investigated the level of monthly online traffic for asbestos removal and survey services in all areas in which they operate – not just the major cities and counties, but right down to the towns and villages in those counties too. We determined there are hundreds of searches per month for ‘asbestos removal Southampton’, ‘asbestos removal Berkshire’, etc. We also determined however that there are small yet significant levels of 20 to 30 searches per month for asbestos removals and surveys in smaller towns and villages (e.g. Thatcham, Brockenhurst, Chippenham), and that no other firm’s website was targeting these searches for SEO purposes. In consultation with the Meyer Environmental, we decided upon a strategy of having individual pages for each of these locations. The intention was that Meyer Environmental would rank number one for all smaller towns and villages, as well as at the upper reaches of page one for the larger cities and counties, and hopefully go on to enjoy a successful conversion rate from all searches that landed on their site. Our senior copywriter spoke to the client to garner all information about how the company now operates, and the services it provides. He took this new information and consolidated it with older material on their existing site to produce keyword-optimised content for each of the almost 100 pages that would feature on the site. Once the content was approved by the client, it was passed on to our designer for the build to start in earnest. Another objective of the re-build was to portray what the company does in a much cleaner and logical manner than was the case on the previous site. The main key colour used throughout the site ties in with the red of the Meyer Environmental logo and is used in callouts and calls to action, and overall, the design is crisp and easy on the eye. Close attention is paid to the layout of typography and selection of images, keeping all pages consistent and straightforward for visitors to the site to follow. The main focal point on all the pages is a call to action that users can use to request a quote from Meyer Environmental. The new website also has a lot of useful information regarding the benefits and dangers of asbestos. We organised this into a FAQ using tabbed accordions to show this information on pages targeted at different audiences (homeowners, owners of commercial properties, tenants and tradesmen). As SEO was key to this project, close attention was paid throughout to all on-page and off-page optimisation techniques, such as alt tags and meta titles. 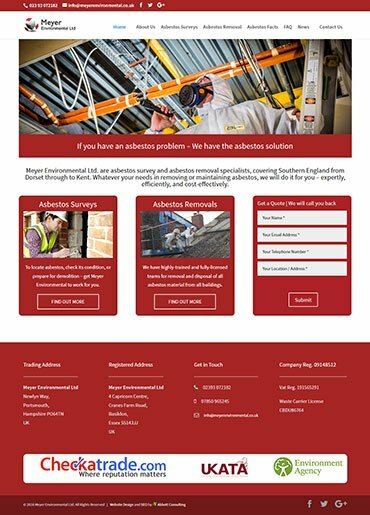 Our client was overjoyed with the finished site and is looking forward to it delivering more leads and more business across the UK. Visit Meyer Environmental to see the results of our work.